60 Sunreef Power FOREVER is the third hull of the new power yacht model, 60 Sunreef Power. It was made in response to the growing demand for compact yet highly impressive powerboats. This yacht has all the features of the popular 70 Sunreef Power, except its 27.8 ft / 8.5 m beam make it more convenient for crowded marinas, especially in the Mediterranean. It is also an interesting alternative for traditional motoryachts with much lower fuel consumption, long range, superb living space offering comfort and intimacy for the owner and his guests, customized interior design and stability. FOREVER is the first Sunreef luxury catamaran built according to the USA technical requirements with electrical voltage of 100V and radio frequency of 60Hz. FOREVER offers the comfort and spaciousness of four large cabins: one owner cabin and three guest cabins. Additionally there is a crew cabin located at port aft/midship and one cabin at port forepeak. The cabins and saloon include comfortable sofas, spacious storage lockers and quality audio-visual systems. 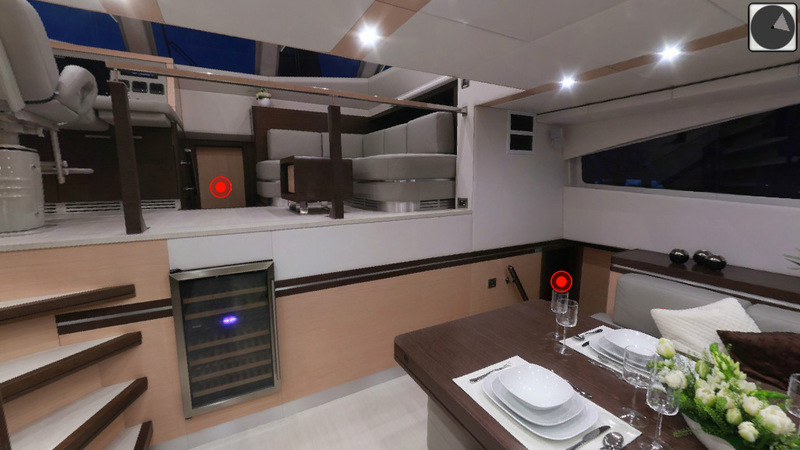 The interior of the main deck features the galley and a dining area, while a mezzanine floor located in the midship with the internal helm station and lounge, provide access to the forward master cabin. The spacious flybridge, Sunreef’s specialty and trademark, comprises the external helm station, wet bar, dining area and a huge sun pad, ideal for outdoor lounging in the sun. FOREVER represents a modern mix of walnut and white oak furniture. The hulls are finished in light grey and the superstructure in white. The yacht also features twin 800 HP MAN engines and a sophisticated anti-vibration system. The flybridge comprises a spa pool. The port of call of FOREVER will be an exclusive marina, featuring luxury villa proprieties, in Cancún on the Mexican Riviera. The owners wish to explore Central America and the Caribbean with their family and friends.